Looking For Computer Training School School? 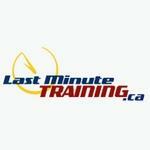 Last Minute Training is a training and seminar registration service located in Toronto, ON. The company gives their members access to hundreds of training program and seminar categories offered at discounted prices. Louis Trahan is the President of Last Minute Training. Products Carried: Last Minute Training is a privately held Toronto, Ontario company that helps small businesses, corporate training buyers, and individuals, purchase training seminars at affordable 'last minute' prices. Members can get from 20 - 60% off regular prices for training programs. Last Minute Training offers discounted prices for seminars in hundreds of different categories.